A Certificate of Biblical studies is also available, a one year study of the Word of God. 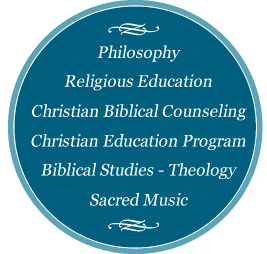 Degrees are awarded through the North Carolina College of Theology Satellite Extension Program. Students may apply to the NCCT external studies program and attend one of the Satellite Schools, located throughout the United States and abroad. Students are responsible for ordering there own graduation /ncct-degree-programs . The appropriate state University of North Carolina authority has declared the relevant degree program of study exempt from requirements for licensure und provisions of North Carolina general statures section G. S. 116-15 (d) for exemption from licensure with respect to religious education. Exemption from licensure is based upon assessment of program quality under established licensing standards.